Their research was published online in December in the Society of Petroleum Engineers’ Journal. More than half of the daily oil produced in the United States comes from unconventional formations. And that number is growing as companies tap into the nation’s more than 35 billion barrels of oil in unconventional reserves, according to the U.S. Energy Information Administration. Companies develop unconventional reservoirs by drilling long horizontal wells and creating hydraulic fractures to allow oil to flow for primary recovery, which currently ranges between 3 to 10 percent of the original oil mass in place. They use commercial software developed based on Darcy’s law to forecast oil recovery and reserves. But, in practice, they do not realize that Darcy’s law—where flow is based on pressure differences—may not be appropriate for shale reservoirs, the researchers say. After primary recovery, Emami said the existing industry practice is to use a conventional gas injection technique known as “huff ‘n’ puff” that improves oil mobility and increases recovery. During the “huff,” the well and fractures are filled with a high-pressure gas, such as carbon dioxide or methane, which is followed by a short “soaking” period where the well is shut. The well is then opened during the “puff” to allow oil to be produced. 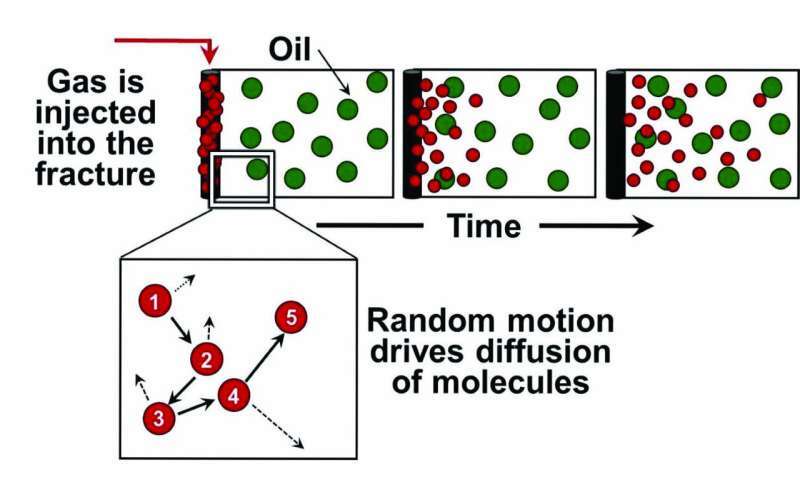 However, this conventional technique works poorly for shale formations, researchers say, because diffusion—not pressure differences—is what principally aids oil recovery in these formations containing nanometer-sized pores. Sorry, nothing to do with physics and everything about engineering. Note the Prof. making the statement is an engineer. Every country needs a professional engineers Act which requires Professional Engineers to be a) registered based on qualifications and experience and comply to a code of ethics. b) prosecute anyone that supplies an engineering service when not registered (including politicians, directors of companies, public servants and heads of global organisations such as the UN, EU, World Bank etc) and c) prosecute professional engineers who breach the code of ethics such as giving advice outside their area of knowledge and expertise. So practically all of Australia’s politicians could be prosecuted under the professional enginers Act (for their part in the electricity scam)? The idea is to wait longer (diffusion) – see ‘Time’ in the graphic below. Companies move quickly with the soak period in between the “huff” and the “puff” because shutting a well is believed to be too costly. Yet, using theoretical calculations, the researchers found that injection of a low-density gas for soak times of two months or more could have massive recovery gains, even when accounting for the downtime. For example, researchers calculated that recovery in a single well could be doubled or tripled using longer soaking periods. Physics is not just a good idea, its the law. This is an innovative and interesting application of the law. Which is of course what engineering is all about. I can safely assume that this has the undivided attention of the reservoir and well engineers in the industry. A rather large concern not well addressed (pun intended) is the use of flammable methane in an oil well setting. Additionally the climate concerned will be beside themselves over the use of their latest ghg obsession, methane. So this is even more interesting, when you think about it.